Submitted by Norm Roulet on Mon, 06/26/2006 - 05:54. As I've come to realize the people of NEO have no warning how dangerous is our environment, I make a point to check out the Ozone readings online at NOACA frequently, and I'm always suprised by the odd findings... like last night, when most of NEO was safe, there was suddenly enough Ozone around Brewster, Ohio, to throw the 8-hour rolling average to unsafe - meaning there were some real nasty peak readings, and something is very wrong in that part of the region. So what gives - I've never heard of Brewster before - anyone have a clue what would cause such wild increases in Ozone in the middle of nowhere, in the middle of the night? Submitted by Norm Roulet on Mon, 06/26/2006 - 15:35. What Are the Major Pollutants? Who Is Polluting Your Community? Submitted by Norm Roulet on Mon, 06/26/2006 - 15:46. 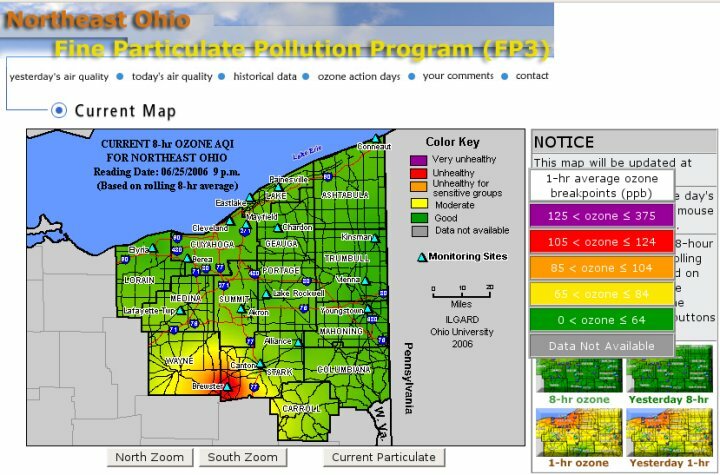 From SCORECARD.GOV, the pollution information site... at least the Federal Government is looking out for the people of NEO... not that it is doing us any good!